The platform is in continuous development and if you missed the news about the launch of its demo version, you can find it here. 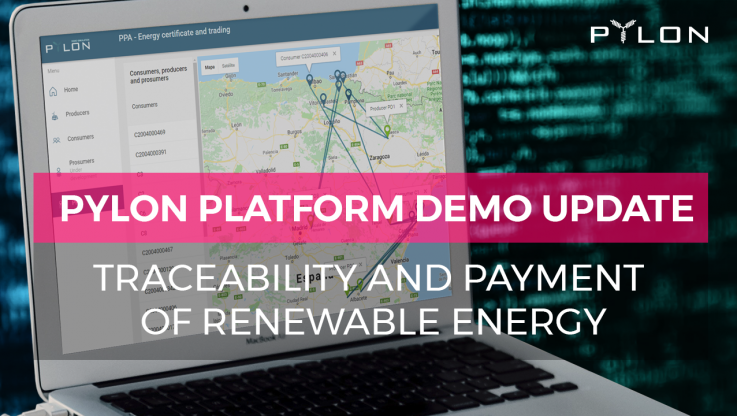 The latest update includes the virtual traceability of renewable energy from bilateral contracts – PPAs – simulated between producers and consumers participating in the pilot test. Consumption data stored in the blockchain and displayed in the simulation platform are acquired using the METRON energy monitoring device. The image above, shows the locations of the different participants of the pilot – producers and consumers. The map lines (traces) are updated according to the available energy of each plant and graphically represent the traceability of energy allowing you to know who buys from whom the energy. The green thumbtacks represent the renewable energy producers, while the blue ones are the consumers. Clicking on any of the thumbtacks gives access to the details of that user – below an example of a producer and a consumer. It can be seen that the production graph of the Producer “PD6”, whose energy is sold through a bilateral contract – PPA – to consumers associated with the platform; the date, the quantity of renewable energy supplied and the identification of the user is recorded permanently in the blockchain. Finally, a unique identification TX number is associated to each of the transactions. These transactions are totally transparent and can be traced in the blockchain, certifying at what moment, how much energy has been generated or consumed – and by whom (identification number). If one of blue thumnail (consumer) is clicked, it takes the demo user to the consumer’s profile, showing: (i) the consumption graph, (ii) the identification of the plant that supplies his/her electricity and the history of operations carried out by the consumer – knowing when, from which producer and how much energy he/she has purchased & consumed. The producer that supplies you with the energy will vary depending on the generation of each plant – in this case Producer PD3, PD1, PD2 or the “Pool” (addrssing to the market pool, in the case there is a deficit of renewable production versus consumption). These are the latest developments in terms of the Pylon Network DEMO. The development continues, with next milestone being the mobile App version. Stay up to date with the Pylon Network news through the our communication channels (see below). PYLON NETWORK. The revolution will not be centralized.